Dr. Sun has nearly 30 years of clinical, education and research experience in Dermatology. Her main research interests are infectious and autoimmune skin disorders. Dr. Sun holds memberships in a number of professional organizations including the Chinese Society of Dermatology, the Chinese Dermatologist Association, the Dermatology Committee of the Chinese Association of Integrative Medicine and the Mycology Committee of the Chinese Society of Microbiology. 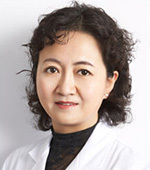 She serves as Vice Chair of the Geriatrics Committee of the Chinese Society of Dermatology and Vice Chair of the Beijing branch of the Chinese Society of Dermatology. She is on the editorial boards of the Chinese Journal of Dermatology, the Journal of Practical Dermatology and the Chinese Medical Journal. Chief Physician at Peking Union Medical College Hospital’s Department of Dermatology. Dr. Sun has published numerous professional papers and served as Editor and Associate Editor for two books in Dermatology. Her current research on the systemic scleroderma susceptibility genes is supported by the National Natural Science Foundation of China. As an educator, she has received several recognitions form the Chinese Academy of Medicine Sciences and the Peking Union Medical College Hospital. She has two patents pending in China.